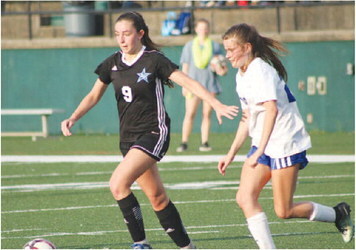 LaGrange High and Brookstone were playing for keeps on Thursday night in girls soccer at Callaway Stadium. Brookstone beat LaGrange, 4-2. By the time the Lady Grangers started to roll, it was too late. LaGrange High lost to Columbus Brookstone, 42 in a girls soccer match at Callaway Stadium on a windy Thursday night. It was a game that could have been won by the Lady Grangers. “We couldn’t keep the ball. We gave it away. They had some fast players, and they were running through us,” said La-Grange High sophomore midfielder Sydney Ormsby. Almost was the key word for the Lady Grangers. They almost scored on a 15-yard shot from Ormsby and a 12- yard attempt from La-Grange High sophomore striker Malone Aldridge in the first half. “We made too many mistakes. We’re trying to put our best team on the field. Brookstone had a lot of talent,” said Lady Granger soccer coach Collin Ross (8-7). The visiting Lady Cougars from Brookstone broke down the LaGrange High defense often, particularly in the first half. The Lady Cougars put the ball in the LaGrange High net for a 3-0 first half lead. Brookstone scored twice off the foot of sophomore forward M Middleton on goals from 18 yards and 16 yards. The Lady Cougars demanded the ball. Dre’a Singelton, the sophomore forward for Brookstone, ransacked the Lady Granger defense, too. Singleton boomed through a 16-yard goal with eight minutes left in the first half. Singleton also scored for the Lady Cougars on another 16-yard kick in the second half. “We had good ball movement,” said Singleton. LaGrange High had a few goals in mind as well in the second half. The Lady Grangers got back in the conversation with a 15yard goal from junior striker Caroline Thompson and then a 20-yard score from Ormsby. “We woke up, and we were confident,”said Ormsby. The Lady Grangers almost came all the way back. They just waited too long to rally. But the effort was noted and appreciated by LaGrange High assistant soccer coach Andy Fritchley. “We were beating some people off the dribble (in the second half),” said Fritchley. But a sloppy first half still cost LHS dearly against Columbus Brookstone. “We lost the midfield. We can be a good team, but sometimes our mistakes turn into goals,” said Fritchley. Lady Granger junior striker Caroline Thompson (9) had no quit in her. Thompson scored a second half goal against Columbus Brookstone on Thursday night.